Hunger exists in Iowa. Learn more & TAKE ACTION! January marks the beginning of another Iowa Legislative Session. This also brings opportunities to speak up for the 389,730 hungry children, adults, and seniors living right here in our state. Governor Branstad assured the state that “together we can” in his Condition of the State address on January 13th. He stated that by “working together we can find a solution to any problem”. 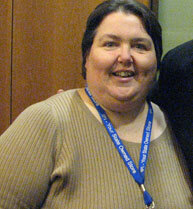 I say, “ABSOLUTELY!” Tackling hunger should be a public-private partnership. Now is the time for all of us to speak up on behalf of our friends and neighbors. 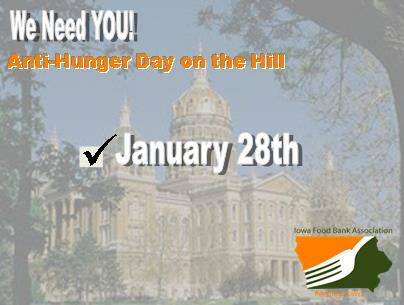 I invite you to join the Iowa Food Bank Association, Feeding America food banks serving Iowa, food pantries, advocates, and volunteers at the Iowa State Capitol for the 2015 Anti-Hunger Day on the Hill on January 28. We’ll be sharing stories, advocating for improved policy, and encouraging our legislators to vote in favor of anti-hunger legislation. Sales Tax Exemption for Food Banks – The Iowa Food Bank Association is requesting sales tax exemption for the eight Feeding America Food Banks that serve all 99 counties. An exemption from sales tax would allow food banks to allocate more funds for programs such as: food distribution, mobile food pantries, Kids Café, Backpack programs, elderly nutrition programs, and community and corporate gardening programs. State Food Purchase Program Appropriation – The Iowa Food Bank Association is requesting that Iowa join the 37 other states who received state support. A State Food Purchase Program Appropriation would allow food banks to purchase food for more than 1,000 emergency feeding organizations that serve all of Iowa’s 99 counties. An appropriation would immediately increase the amount of food distributed and reduce the devastating impact of hunger. A $1,000,000 appropriation would create 4,500,000 meals for Iowans. Advocating on behalf of hungry Iowans is the best thing we can do. We not only need to share the stories of our struggling friends and neighbors, we also need to share the stories of success. Addressing hunger has a lasting impact on an individual’s health, a child’s education opportunity, and the state’s economy. This issue cannot be ignored if we all do our part. It’s time that our elected leaders understand that addressing hunger should be a public-private partnership. As Governor Branstad so enthusiastically said in his Address, “working together we can find a solution to any issue”. Let’s hold him to that. An informational and training webinar will be held Thursday, January 22. Please RSVP to advocacy@iowafba.org to register. There are many times we feel a great sense of accomplishment doing SNAP Outreach, since the whole goal is to reach out to those in need and try to fill in at least one gap for those in need through food assistance. But I have found the satisfaction is tenfold during the holiday season because our assistance often makes the difference for families at what can be a most difficult time. An example would be “Maggie” who left me a very distraught message two days before Thanksgiving because she had heard nothing from DHS after having her phone interview . By the time I reached her the next day, she had received her card in the mail with her retroactive benefits and she was ecstatic because they would be shopping for a wonderful Thanksgiving meal! Or “Paul” who I assisted while he was signing up for Salvation Army’s holiday basket and toys, who pointed out that the SNAP benefits they would receive would relieve their stress for months past the holidays, for which he was very grateful. The examples go on and on but the message is the same. I can tell you, I enjoyed the holidays even more because I can remember the families who have touched me this year. Happy New Year!